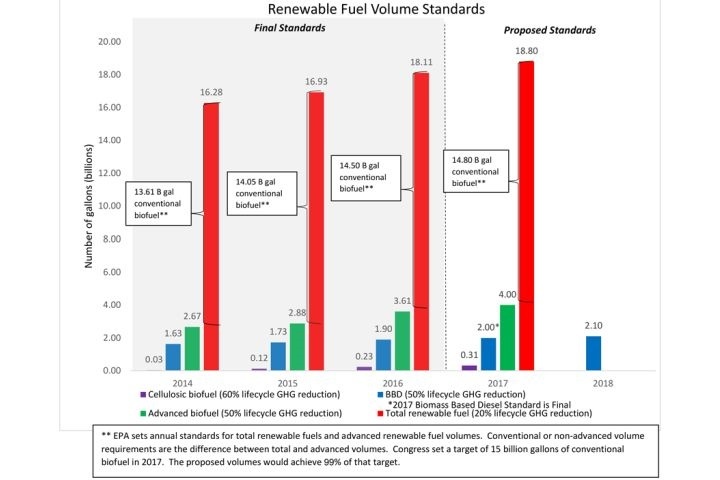 The U.S. Environmental Protection Agency (EPA) has proposed increases in renewable fuel volume requirements across all types of biofuels under the Renewable Fuel Standard program, which was passed in 2005 and expanded in 2007. Per the EPA’s requirements, fuel producers would need to blend 18.8 billion gallons of renewable fuels in 2017, an increase from the 18.11 billion gallons required in 2016. The legislation also set a goal for 36 billion gallons in 2022. The proposed volume requirements and associated percentage standards are for calendar year 2017 at 0.173% for cellulosic biofuel, 1.67% for biomass-based diesel, 2.22% for advanced biofuel and 10.44% for total renewable fuel. Additionally, the EPA proposed the volume requirement for biomass-based fuel at 2.1 billion gallons by 2018. The EPA says these increases would boost production and enable ambitious-yet-achievable growth. Advanced renewable fuel – which requires 50% lifecycle carbon emissions reductions – would grow by nearly 400 million gallons between 2016 and 2017. The non-advanced or “conventional” fuels portion of total renewable fuels – which requires a minimum of 20% lifecycle carbon emissions reductions – would increase by 300 million gallons between 2016 and 2017 and achieve 99% of the Congressional target of 15 billion gallons. Biomass-based biodiesel – which must achieve at least 50% lifecycle emissions reductions – would grow by 100 million gallons between 2017 and 2018. Cellulosic biofuel – which requires 60% lifecycle carbon emissions reductions – would grow by 82 million gallons, or 35% between 2016 and 2017. Chart courtesy of the EPA.